Theme: Since values are more often caught than taught, we parents and guardians have the wonderful opportunity of helping children and youth to take hold of the gospel by providing an atmosphere of warmth, openness and grace and allowing our young people to witness our own behavior, including our mistakes and our requests for forgiveness. Presentation Notes: Throughout the following outline, numbers in parentheses (1), (2), (3) are used to indicate items from the section called Sermon Illumination which may be used for illustration. The addition of your personal illustrations will enhance the presentation. In Deuteronomy 6:6-9, God gives guidance to parents to help them inspire faith in their children and a desire to know and serve God. His mandates to mothers and fathers include: having His commandments in their hearts, sharing His commandments with their children, and modeling His commandments in their lives at all times. Parents cannot pass on to their children what they do not have themselves. Faith and commitment to God must dwell in their hearts first. It is impossible for His commandments to be within us in the way God intends without comprehending them within the context of the good news of the gospel. The acceptance of the gospel of Jesus is a prerequisite to having God’s commandments in one’s heart. Accepting God’s grace through faith. “For it is by grace you have been saved, through faith-and this not from yourselves, it is the gift of God” (Eph. 2:8). Grace and faith are shown here to be two important elements at the core of the gospel of Jesus Christ. Grace is unmerited favor, undeserved good will. Salvation is ours when we accept God’s grace by faith. Faith is resting in God, putting one’s whole trust in Him. The life of a parent who constantly relies on God for everything he or she is and does demonstrates the meaning of faith to a child (Gal. 3:26; John 3:16; Mark 16:15,16; Heb. 11:6; John 1:16). Accepting God’s power in your life. “I am not ashamed of the gospel, because it is the power of God for the salvation of everyone who believes” (Rom. 1:16a). When one accepts the salvation which God has given to the world in Christ-His gift of grace-we experience God’s mighty power to save us in Christ. Our minds and hearts are transformed as He writes His laws within them. His commandments abide in the heart through the power received when salvation is accepted. These truths are for us as parents to experience and we may then share them with our offspring (John 1:12; 2 Cor. 12:9; Titus 2:11, 12; Heb. 8:10; 13:9; Rom. 5:20, 21; 12:2). As God instructed Israelite parents to impress upon their children the ways of the Lord, so He would have us do today. This sharing is something He knows can be done in a special way by parents and it is to be given a high priority. Mother. The mother is comfortable about frequently sharing her faith with her children. Father. The father is comfortable about frequently sharing his faith with his children. Support. Parents communicate with children frequently in a positive and supportive way. Control . Parents have high standards, set time limits, and enforce them with love. In order to bring the gospel to youth in the home, then, parents need to have a living faith that is communicated to their children in their everyday interaction-while driving down the street, working in the garden, riding on the train, reading together, playing together, and worshiping together. Children and youth feel most secure in their religious values when there are boundaries that are lovingly enforced. Just as adults feel more comfortable driving across a bridge which has sides, youth will perceive boundaries that are implemented kindly and firmly as a protection and a communication of love and concern by their parents. A grace orientation toward salvation. Parents need to share with their youth the biblical concept of salvation as the gift of a loving God to undeserving creatures. It is not good behavior which saves us. There isn’t anything we can do to earn salvation. All we can do is accept the gift which comes with overcoming power. With the gift comes a yearning for communion with the Giver, a personal relationship with Jesus. It is that relationship that informs and directs our behavior, not our behavior that puts us into favor with God (Eph. 2:8; John 1:12; John 3:16). Joy in worshiping God in all facets of life. Young people need to understand that there is no dichotomy in the life of the Christian. In every enterprise one should bring glory to God. Whether in the class room or on the playing field, whether at home or at church, whether at work or in recreation, youth must be encouraged to develop an awareness of the presence of God in their lives and to find joy in the awareness of His presence (1 Cor. 10:31). Service opportunities for ministry to others. There is nothing that builds muscle, physical or spiritual, like exercise. A faith that is only theoretical will soon be a faith that is weak and inefficient. Providing youth with opportunities to be of service to others will help develop feelings of worth-“I can make a difference in the lives of others.” These feelings translate into a way of life-one of service to God and to one’s neighbor. Service is a bridge from theoretical faith to active faith. There is a well known saying that states: “Do as I say, but don’t do as I do.” A television commercial on substance abuse shows a father and son in the son’s bedroom. The father catches his son smoking marijuana and in anger shouts, “Where did you learn to do that?” The son angrily retorts, “By watching you.” The father is perplexed because he is not involved with illegal drugs. The son has seen him, however, with other “legal,” but also detrimental, drugs. To be sure, many of us are concerned about our children who are growing up in our homes and not accepting Jesus Christ and being baptized. This kind of decision does not take place in a vacuum. “By beholding we become changed.” It takes more than just telling our children that they need to be baptized. By the way we live daily, we witness positively or negatively to them. All our pious prayers at church are likely to be ineffective if there is harshness, impatience and lack of love at home. Communicating the gospel to our children is what we might call a “24-7” enterprise-an effort that we make all day, everyday, regardless of what we’re doing; interacting at home or outside of the home, early in the morning and late at night, by the daily rituals of our lives at home and the priority we give to spiritual matters there, by our kindness, our caring and our love, we testify of Jesus and His saving grace. Even when we make mistakes (and we will), learning how to ask each other and our children for forgiveness will share the reality of God’s forgiveness and willingness to give us a new opportunity and strength to live victoriously for Him. The writer of Deuteronomy is clear with the directives from God. We must have a personal experience and relationship with our Lord by accepting His grace and being empowered to live for Him. We should be deliberate about sharing our spiritual values with our children in an atmosphere of acceptance, openness and warmth. And we should be mindful of the fact that we are witnessing to our children even when we are not aware of it. So often what we do is more important than what we say. By ourselves this enterprise is impossible, but “with God all things are possible.” If we have been less successful in this enterprise of communicating the good news of the gospel to our children than we had hoped, we can with confidence lift them in prayer before our gracious heavenly Father who knows and understands both us and them. As we turn to Him, we can receive forgiveness for our own shortcomings. 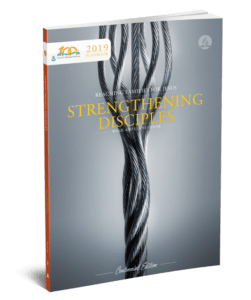 We can gain deeper insights into the good news of the gospel, discover more effective ways of using our influence, and receive new strength to continue in our relationships with our children and, hopefully, rebuild relationships that have been damaged. Best of all, we can get a fresh grasp on the assurance that by God’s own act in Christ He has cared for our salvation and the salvation of our children. We can trust Him with that. With renewed hope we can go about the wonderful work of issuing, through life and word, the invitation to accept His gracious gift. Mother. When the mother is highly religious, is comfortable talking about her faith, shares her faith often with her children, and has discussions about faith with the young people, youth are more likely to mature in faith and develop commitment to a religious outlook. Father. When the father is highly religious, is comfortable talking about his own faith, often shares his faith with his children, and has regular discussions about faith with them, they are more likely to reveal a growing mature faith and a sense of loyalty to their denomination. Support. When parent-child communication is frequent and positive, when family life is experienced as loving, caring, and supportive, and when parents frequently help their children with school work, youth are more likely to possess a growing, rich faith, and a sense of loyalty to their denomination. Control. When parents hold strong standards, and enforce them fairly, firmly, and lovingly, punish wrong behavior, and set limits on their child’s use of time, the young people tend to grow in mature faith and manifest commitment and loyalty to their church. Though control factors have the least impact of any of the five groups, control seems to be positive for the home environment even though it is not for the religious school and the congregation. When discipline comes from people whom we know love us, it is best received. Six (6): Both Jessica and Julian, our children, were born in New York City where we lived for quite some time. If you live and drive in New York City, or if you have ever visited Manhattan and had the good fortune (!!) of driving in that volume of traffic you know what we are talking about; you will develop some impatience with the traffic. You begin to talk to the other drivers under your breath. Sometimes it’s not under your breath. You shout, “Let’s go” and, “Come on man.” These are common expressions used as the traffic light is about to turn green and the vehicle in front of you has not yet moved. On another occasion, after about 18 months of family worship following the birth of Jessica, we were musing about her future and wondering to ourselves if she would someday decide to become a Seventh-day Adventist Christian. As we knelt to pray to conclude family worship, our daughter began to pray. Her speech was hardly intelligible, but our hearts raced with joy and we were almost overcome with emotion as we recognized that our positive modeling was beginning to pay-off. Coles, R. (1997). The moral intelligence of children . New York, NY: Random House. Gaebelein, F. E., General Editor. (1992). The expositor’s bible commentary . Grand Rapids, MI: Zondervan Publishing House. Jemison, T. H. (1959). Christian beliefs . Mountain View, CA: Pacific Press Publishing Association. Larson, R. and D., with Gillespie, V. B. (1992). Project affirmation: Teaching values . Riverside, CA: La Sierra University Press. Tyner, S. (1996). The colors of grace in our homes . Lincoln, Nebraska: Advent Source . White, E. G. (1954). Child guidance . Washington, DC: Review and Herald Publishing Association. Reprinted from Karen & Ron Flowers, Families Filled with Joy. Silver Spring, MD: Department of Family Ministries, General Conference of Seventh-day Adventists, 1998.